Richard Gasquet is a French tennis player who is famous all over the world for his one-handed backhand that is devastating and elegant in equal measure. Blessed with an aesthetic game that appeals to connoisseurs everywhere, Gasquet's career has sometimes been more about style than substance. That said, he has achieved a great deal of success in his decade-long career so far, having reached multiple Grand Slam semifinals and Masters finals. 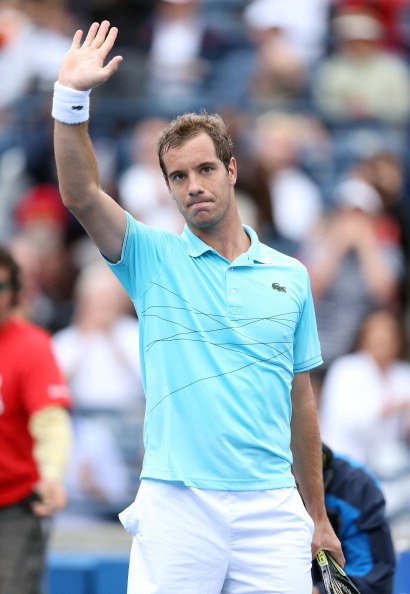 Gasquet is not the most attacking of players, but is comfortable in every part of the court. Capable of mixing defense with offense seamlessly, his game translates well to all surfaces. Gasquet uses topspin-heavy groundstrokes, and his forehand in particular can generate a lot of loop. His backhand, hit with an exaggerated backswing, is flatter when he's dealing with short balls, but the Frenchman can also generate tremendous topspin off that wing. Gasquet has a traditional backhand slice that stays low with the amount of underspin imparted on it. He also frequently uses drop shots and short slices to draw his opponent forward. Gasquet changes his net approaching strategy based on the speed of the court. On clay and other slow surfaces he prefers to stay back most of the time, while he rushes the net and even occasionally serves and volleys on grass and other quick surfaces. Without question, Gasquet's backhand is his single biggest and most famous weapon. With a no-holds-barred take-back and elongated follow-through, the Gasquet backhand has won unanimous praise over the years for its beauty as well as its effectiveness. The Frenchman can do literally anything with his backhand. He can hit it on the rise to take time away from the opponent, go back behind the baseline and roll it with heavy topspin, and crunch flat strikes from inside the baseline for winners. He is equally comfortable hitting it crosscourt or down the line, and can defend off it just as easily as he can attack. Gasquet's forehand is considerably less potent, and in fact is considered a serious liability in his game. It has a little too much topspin and not enough forward thrust, because of which he struggles to stay with his opponents in forehand-to-forehand exchanges. The Frenchman's serve is also not nearly as lethal as most top 10 players. With a little too much spin and not enough flat power, Gasquet often struggles to win free points or hold serve comfortably. He is very proficient with his volleying though, and sometimes makes up for his lack of depth on the serve and forehand by making surprise attacks at the net. His defense is also quite impressive, and he can hit winners - especially off his backhand - even from well behind the baseline. Gasquet was born in Beziers, France, and comes from a family deeply entrenched in tennis. His father Francis managed a tennis club, and introduced him to the sport at the age of four, while mother Maryse is also a tennis teacher. Gasquet was a child prodigy in every sense of the term. At the age of just nine, he was featured on the cover of French Tennis Magazine (February 1996 issue) and earmarked as a future great. He went on to fulfill the expectations on the junior circuit, winning the French Open and US Open boys' titles in 2002. When he first burst on to the tour, many took to calling him 'Baby Federer' because of the similarities his game had with that of Swiss legend Roger Federer. However, as time passed Gasquet shed that moniker; his backhand was, by most accounts, far more lethal than Federer's, and deserved its own special place in tennis history. The Frenchman hasn't quite lived up to the hype that surrounded him as a teenager, but he has put together a respectable career for himself. While he has remained a step lower than the Big 4, he has put in commendable efforts against the rest of the players, and his solid Grand Slam results speak for themselves. Roland Garros 2017 diary: Kiki's expressiveness makes up for Gasquet's wasted artistry, but what's wrong with Djokovic? Barcelona Open: Can Rafael Nadal clinch his 9th title?